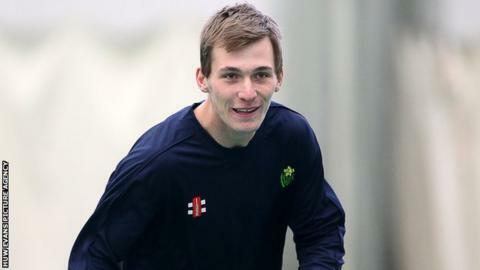 New Glamorgan batsman Nick Selman was undefeated on 35 as rain scuppered the one-day friendly with Cardiff MCCU. Glamorgan ended the contest 162-2 off 31 overs with openers Mark Wallace and Jacques Rudolph scoring 37 and 44 respectively. Selman shared a stand of 63 with David Lloyd. The 20-year-old Australian-born batsman is aiming to challenge for a place in the top order ahead of the new LV=Championship campaign. Glamorgan eased to a seven wicket win over Gloucestershire in their opening warm-up match in Cardiff. Selman earned a contract after playing two games for Glamorgan second eleven, having played most of the 2015 season for Kent seconds. "When I came over a couple of years ago just training alongside first-class players over in Kent, that was a dream and a goal to get a professional contract," Selman said. "To get a contract here was great and hopefully I can break my way into the first-team in all formats." Selman played cricket to state under-19 level in Queensland but did not make the senior team. "It didn't really work out in Queensland so I was delighted when I got offered a deal over here" he told BBC Wales Sport. "There's a lot of first-class players who play club cricket down in Australia, that's a very good competition so I think I'll be ready for it (the step up)." Selman's signing is designed to provide added competition for top three places in the Glamorgan batting line-up. "It's going to be tough (to break into the first team), but hopefully I'll have a good pre-season" he said. "I prefer to open but if I'm needed to bat middle-order, or three or four, then I'm happy to do it."